You are currently browsing the category archive for the ‘math.MP’ category. This coming fall quarter, I am teaching a class on topics in the mathematical theory of incompressible fluid equations, focusing particularly on the incompressible Euler and Navier-Stokes equations. These two equations are by no means the only equations used to model fluids, but I will focus on these two equations in this course to narrow the focus down to something manageable. I have not fully decided on the choice of topics to cover in this course, but I would probably begin with some core topics such as local well-posedness theory and blowup criteria, conservation laws, and construction of weak solutions, then move on to some topics such as boundary layers and the Prandtl equations, the Euler-Poincare-Arnold interpretation of the Euler equations as an infinite dimensional geodesic flow, and some discussion of the Onsager conjecture. I will probably also continue to more advanced and recent topics in the winter quarter. for incompressible Navier-Stokes (or, if one drops the viscosity term , the Euler equations). Our discussion in this set of notes is physical rather than mathematical, and so we will not be working at mathematical levels of rigour and precision. In particular we will be fairly casual about interchanging summations, limits, and integrals, we will manipulate approximate identities as if they were exact identities (e.g., by differentiating both sides of the approximate identity), and we will not attempt to verify any regularity or convergence hypotheses in the expressions being manipulated. (The same holds for the exercises in this text, which also do not need to be justified at mathematical levels of rigour.) Of course, once we resume the mathematical portion of this course in subsequent notes, such issues will be an important focus of careful attention. This is a basic division of labour in mathematical modeling: non-rigorous heuristic reasoning is used to derive a mathematical model from physical (or other “real-life”) principles, but once a precise model is obtained, the analysis of that model should be completely rigorous if at all possible (even if this requires applying the model to regimes which do not correspond to the original physical motivation of that model). See the discussion by John Ball quoted at the end of these slides of Gero Friesecke for an expansion of these points. This is a bounded self-adjoint operator and thus has a spectrum that is a compact subset of the real line; it arises in a number of physical contexts, most notably in the theory of the integer quantum Hall effect, though I will not discuss these applications here. Remarkably, the structure of this spectrum depends crucially on the Diophantine properties of the frequency . For instance, if is a rational number, then the operator is periodic with period , and then basic (discrete) Floquet theory tells us that the spectrum is simply the union of (possibly touching) intervals. But for irrational (in which case the spectrum is independent of the phase ), the situation is much more fractal in nature, for instance in the critical case the spectrum (as a function of ) gives rise to the Hofstadter butterfly. The “ten martini problem” asserts that for every irrational and every choice of coupling constant , the spectrum is homeomorphic to a Cantor set. Prior to the work of Avila and Jitormiskaya, there were a number of partial results on this problem, notably the result of Puig establishing Cantor spectrum for a full measure set of parameters , as well as results requiring a perturbative hypothesis, such as being very small or very large. The result was also already known for being either very close to rational (i.e. a Liouville number) or very far from rational (a Diophantine number), although the analyses for these two cases failed to meet in the middle, leaving some cases untreated. The argument uses a wide variety of existing techniques, both perturbative and non-perturbative, to attack this problem, as well as an amusing argument by contradiction: they assume (in certain regimes) that the spectrum fails to be a Cantor set, and use this hypothesis to obtain additional Lipschitz control on the spectrum (as a function of the frequency ), which they can then use (after much effort) to improve existing arguments and conclude that the spectrum was in fact Cantor after all! Manjul Bhargava produces amazingly beautiful mathematics, though most of it is outside of my own area of expertise. One part of his work that touches on an area of my own interest (namely, random matrix theory) is his ongoing work with many co-authors on modeling (both conjecturally and rigorously) the statistics of various key number-theoretic features of elliptic curves (such as their rank, their Selmer group, or their Tate-Shafarevich groups). For instance, with Kane, Lenstra, Poonen, and Rains, Manjul has proposed a very general random matrix model that predicts all of these statistics (for instance, predicting that the -component of the Tate-Shafarevich group is distributed like the cokernel of a certain random -adic matrix, very much in the spirit of the Cohen-Lenstra heuristics discussed in this previous post). But what is even more impressive is that Manjul and his coauthors have been able to verify several non-trivial fragments of this model (e.g. showing that certain moments have the predicted asymptotics), giving for the first time non-trivial upper and lower bounds for various statistics, for instance obtaining lower bounds on how often an elliptic curve has rank or rank , leading most recently (in combination with existing work of Gross-Zagier and of Kolyvagin, among others) to his amazing result with Skinner and Zhang that at least of all elliptic curves over (ordered by height) obey the Birch and Swinnerton-Dyer conjecture. Previously it was not even known that a positive proportion of curves obeyed the conjecture. This is still a fair ways from resolving the conjecture fully (in particular, the situation with the presumably small number of curves of rank and higher is still very poorly understood, and the theory of Gross-Zagier and Kolyvagin that this work relies on, which was initially only available for , has only been extended to totally real number fields thus far, by the work of Zhang), but it certainly does provide hope that the conjecture could be within reach in a statistical sense at least. on the two-torus , where is a Gaussian field that forces a fixed set of frequencies. It is expected that for any reasonable choice of initial data, the solution to this equation should asymptotically be distributed according to Kolmogorov’s power law, as discussed in this previous post. This is still far from established rigorously (although there are some results in this direction for dyadic models, see e.g. this paper of Cheskidov, Shvydkoy, and Friedlander). However, Hairer and Mattingly were able to show that there was a unique probability distribution to almost every initial data would converge to asymptotically; by the ergodic theorem, this is equivalent to demonstrating the existence and uniqueness of an invariant measure for the flow. Existence can be established using standard methods, but uniqueness is much more difficult. One of the standard routes to uniqueness is to establish a “strong Feller property” that enforces some continuity on the transition operators; among other things, this would mean that two ergodic probability measures with intersecting supports would in fact have a non-trivial common component, contradicting the ergodic theorem (which forces different ergodic measures to be mutually singular). Since all ergodic measures for Navier-Stokes can be seen to contain the origin in their support, this would give uniqueness. Unfortunately, the strong Feller property is unlikely to hold in the infinite-dimensional phase space for Navier-Stokes; but Hairer and Mattingly develop a clean abstract substitute for this property, which they call the asymptotic strong Feller property, which is again a regularity property on the transition operator; this in turn is then demonstrated by a careful application of Malliavin calculus. Maryam Mirzakhani has mostly focused on the geometry and dynamics of Teichmuller-type moduli spaces, such as the moduli space of Riemann surfaces with a fixed genus and a fixed number of cusps (or with a fixed number of boundaries that are geodesics of a prescribed length). These spaces have an incredibly rich structure, ranging from geometric structure (such as the Kahler geometry given by the Weil-Petersson metric), to dynamical structure (through the action of the mapping class group on this and related spaces), to algebraic structure (viewing these spaces as algebraic varieties), and are thus connected to many other objects of interest in geometry and dynamics. For instance, by developing a new recursive formula for the Weil-Petersson volume of this space, Mirzakhani was able to asymptotically count the number of simple prime geodesics of length up to some threshold in a hyperbolic surface (or more precisely, she obtained asymptotics for the number of such geodesics in a given orbit of the mapping class group); the answer turns out to be polynomial in , in contrast to the much larger class of non-simple prime geodesics, whose asymptotics are exponential in (the “prime number theorem for geodesics”, developed in a classic series of works by Delsart, Huber, Selberg, and Margulis); she also used this formula to establish a new proof of a conjecture of Witten on intersection numbers that was first proven by Kontsevich. More recently, in two lengthy papers with Eskin and with Eskin-Mohammadi, Mirzakhani established rigidity theorems for the action of on such moduli spaces that are close analogues of Ratner’s celebrated rigidity theorems for unipotently generated groups (discussed in this previous blog post). Ratner’s theorems are already notoriously difficult to prove, and rely very much on the polynomial stability properties of unipotent flows; in this even more complicated setting, the unipotent flows are no longer tractable, and Mirzakhani instead uses a recent “exponential drift” method of Benoist and Quint as a substitute. Ratner’s theorems are incredibly useful for all sorts of problems connected to homogeneous dynamics, and the analogous theorems established by Mirzakhani, Eskin, and Mohammadi have a similarly broad range of applications, for instance in counting periodic billiard trajectories in rational polygons. As in the previous post, all computations here are at the formal level only. for any closed loop in , or equivalently pointwise conservation of the Lagrangian vorticity , where is the -form associated with the vector field using the Euclidean metric on , with denoting pullback by . or pointwise conservation of the Lagrangian vorticity . These applications of Noether’s theorem proceed exactly as the previous post; we leave the details to the interested reader. This equation has strong analogies with the three-dimensional incompressible Euler equations, and can be viewed as a simplified model for that system; see this paper of Constantin, Majda, and Tabak for details. (which up to trivial transformations is ). Finally, diffeomorphism invariance gives pointwise conservation of Lagrangian vorticity , thus is transported by the flow (which is also evident from (3). In particular, all integrals of the form for a fixed function are conserved by the flow. The two postulates of special relativity: firstly, that the laws of physics are the same in every inertial reference frame, and secondly that the speed of light in vacuum is equal in every such inertial frame. Planck’s relation and de Broglie’s law for photons, relating the frequency, energy, and momentum of such photons together. The law of conservation of energy, and the law of conservation of momentum, as well as the additivity of these quantities (i.e. the energy of a system is the sum of the energy of its components, and similarly for momentum). The Newtonian approximations , to energy and momentum at low velocities. The argument was one-dimensional in nature, in the sense that only one of the three spatial dimensions was actually used in the proof. The Newtonian approximation at low velocities. The argument (which uses a little bit of calculus, but is otherwise elementary) is given below the fold. Whereas Einstein’s original argument considers a mass emitting two photons in several different reference frames, the argument here considers a large mass breaking up into two equal smaller masses. Viewing this situation in different reference frames gives a functional equation for the relationship between energy, mass, and velocity, which can then be solved using some calculus, using the Newtonian approximation as a boundary condition, to give the famous formula. A few days ago, I released a preprint entitled “Localisation and compactness properties of the Navier-Stokes global regularity problem“, discussed in this previous blog post. As it turns out, I was somewhat impatient to finalise the paper and move on to other things, and the original preprint was still somewhat rough in places (contradicting my own advice on this matter), with a number of typos of minor to moderate severity. But a bit more seriously, I discovered on a further proofreading that there was a subtle error in a component of the argument that I had believed to be routine – namely the persistence of higher regularity for mild solutions. As a consequence, some of the implications stated in the first version were not exactly correct as stated; but they can be repaired by replacing a “bad” notion of global regularity for a certain class of data with a “good” notion. I have completed (and proofread) an updated version of the ms, which should appear at the arXiv link of the paper in a day or two (and which I have also placed at this link). (In the meantime, it is probably best not to read the original ms too carefully, as this could lead to some confusion.) 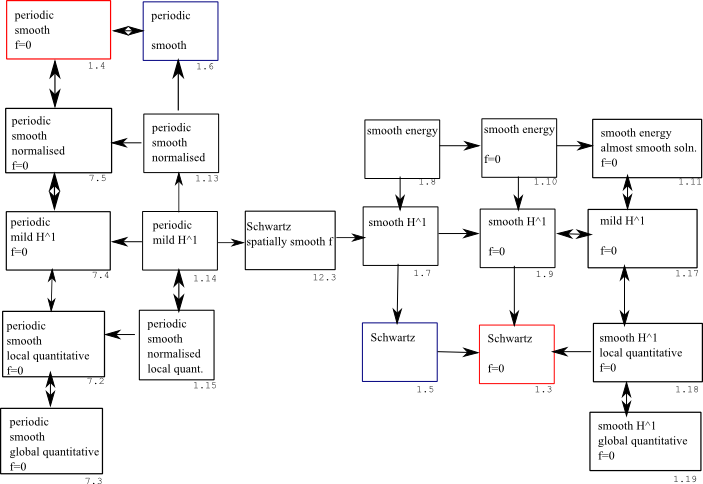 I’ve also added a new section that shows that, due to this technicality, one can exhibit smooth initial data to the Navier-Stokes equation for which there are no smooth solutions, which superficially sounds very close to a negative solution to the global regularity problem, but is actually nothing of the sort. for some field . Suppose one already knew that had some regularity in space, and in particular the norm of was bounded (thus and up to two spatial derivatives of were bounded). Then, by (1), we see that two time derivatives of were also bounded, and one then gets the additional regularity of . one can conclude that also has the regularity of . One can continue this process indefinitely; in particular, if one knew that , then these sorts of manipulations show that is infinitely smooth in both space and time. For later times t>0 (and assuming homogeneous data f=0 for simplicity), this issue no longer arises, because of the instantaneous smoothing effect of the Navier-Stokes flow, which for instance will upgrade regularity to regularity instantaneously. It is only the initial time at which some time irregularity can occur. For every , exist and are continuous on the full slab . Thus, an almost smooth solution is the same concept as a smooth solution, except that at time zero, the velocity field is only , and the pressure field is only . This is still enough regularity to interpret the Navier-Stokes equation (2) in a classical manner, but falls slightly short of full smoothness. One can now “fix” the global regularity conjectures for Navier-Stokes in the smooth or smooth finite energy setting by requiring the solutions to merely be almost smooth instead of smooth. Once one does so, the results in my paper then work as before: roughly speaking, if one knows that Schwartz data produces smooth solutions, one can conclude that smooth or smooth finite energy data produces almost smooth solutions (and the paper now contains counterexamples to show that one does not always have smooth solutions in this category). in three dimensions. Thus, we specify initial data , where is a time, is the initial velocity field (which, in order to be compatible with (2), (3), is required to be divergence-free), is the forcing term, and then seek to extend this initial data to a solution with this data, where the velocity field and pressure term are the unknown fields. where is the -shaped contour consisting of the positive real axis and the upper imaginary axis, with being interpreted with the standard branch (with cut on the negative axis). One can show by contour integration that this function solves the heat equation and is smooth (but rapidly growing at infinity), and vanishes for , but is not identically zero for . (Finite energy data) One has and . ( data) One has and . (Schwartz data) One has and for all . (Periodic data) There is some such that and for all and . Note that smoothness alone does not necessarily imply finite energy, , or the Schwartz property. For instance, the (scalar) function is smooth and finite energy, but not in or Schwartz. Periodicity is of course incompatible with finite energy, , or the Schwartz property, except in the trivial case when the data is identically zero. (Finite energy solution) One has . ( solution) One has and . (Partially periodic solution) There is some such that for all and . (Fully periodic solution) There is some such that and for all and . (The component of the solution is for technical reasons, and should not be paid too much attention for this discussion.) Note that we do not consider the notion of a Schwartz solution; as we shall see shortly, this is too restrictive a concept of solution to the Navier-Stokes equation. (Leray-Hopf weak solution) The solution is not smooth, but lies in , solves (1) in the sense of distributions (after rewriting the system in divergence form), and obeys an energy inequality. for some function . One can make a further distinction between local quantitative results, in which is allowed to depend on , and global quantitative results, in which there is no dependence on (the latter is only reasonable though in the homogeneous case, or if has some decay in time). Conjecture 1.4 (Qualitative regularity for homogeneous periodic data) If is periodic, smooth, and homogeneous, then there exists a smooth partially periodic solution with this data. Conjecture 1.3 (Qualitative regularity for homogeneous Schwartz data) If is Schwartz and homogeneous, then there exists a smooth finite energy solution with this data. Conjecture 1.6 (Qualitative regularity for periodic data) If is periodic and smooth, then there exists a smooth partially periodic solution with this data. Conjecture 1.5 (Qualitative regularity for Schwartz data) If is Schwartz, then there exists a smooth finite energy solution with this data. Note in the periodic formulations of the Clay prize problem that the solution is only required to be partially periodic, rather than fully periodic; thus the pressure has no periodicity hypothesis. One can ask the extent to which the above problems change if one also requires pressure periodicity. In another direction, one can ask the extent to which quantitative formulations of the Navier-Stokes problem are stronger than their qualitative counterparts; in particular, whether it is possible that each choice of initial data in a certain class leads to a smooth solution, but with no uniform bound on that solution in terms of various natural norms of the data. Finally, one can ask the extent to which the conjecture depends on the category of data. For instance, could it be that global regularity is true for smooth periodic data but false for Schwartz data? True for Schwartz data but false for smooth data? And so forth. and one can easily concoct examples for which the right-hand side is non-zero at time zero. This suggests that the Schwartz class may be unnecessarily restrictive for Conjecture 1.3 or Conjecture 1.5. (Homogenisation) If one only assumes partial periodicity instead of full periodicity, then the forcing term becomes irrelevant. In particular, Conjecture 1.4 and Conjecture 1.6 are equivalent. (Concentration compactness) In the category (both periodic and nonperiodic, homogeneous or nonhomogeneous), the qualitative and quantitative formulations of the Navier-Stokes global regularity problem are essentially equivalent. (Localisation) The (inhomogeneous) Navier-Stokes problems in the Schwartz, smooth , and finite energy categories are essentially equivalent to each other, and are also implied by the (fully) periodic version of these problems. The first two of these families of results are relatively routine, drawing on existing methods in the literature; the localisation results though are somewhat more novel, and introduce some new local energy and local enstrophy estimates which may be of independent interest. Broadly speaking, the moral to draw from these results is that the precise formulation of the Navier-Stokes equation global regularity problem is only of secondary importance; modulo a number of caveats and technicalities, the various formulations are close to being equivalent, and a breakthrough on any one of the formulations is likely to lead (either directly or indirectly) to a comparable breakthrough on any of the others. The above three streams of results are discussed in more detail below the fold. As we are all now very much aware, tsunamis are water waves that start in the deep ocean, usually because of an underwater earthquake (though tsunamis can also be caused by underwater landslides or volcanoes), and then propagate towards shore. Initially, tsunamis have relatively small amplitude (a metre or so is typical), which would seem to render them as harmless as wind waves. And indeed, tsunamis often pass by ships in deep ocean without anyone on board even noticing. at least until the amplitude becomes comparable to the water depth (at which point the assumptions that underlie the above approximate results break down; also, in two (horizontal) spatial dimensions there will be some decay of amplitude as the tsunami spreads outwards). If one starts with a tsunami whose initial amplitude was at depth and computes the point at which the amplitude and depth become comparable using the proportionality relationship (2), some high school algebra then reveals that at this point, amplitude of a tsunami (and the depth of the water) is about . Thus, for instance, a tsunami with initial amplitude of one metre at a depth of 2 kilometres can end up with a final amplitude of about 5 metres near shore, while still traveling at about ten metres per second (35 kilometres per hour, or 22 miles per hour), and we have all now seen the impact that can have when it hits shore. While tsunamis are far too massive of an event to be able to control (at least in the deep ocean), we can at least model them mathematically, allowing one to predict their impact at various places along the coast with high accuracy. (For instance, here is a video of the NOAA’s model of the March 11 tsunami, which has matched up very well with subsequent measurements.) 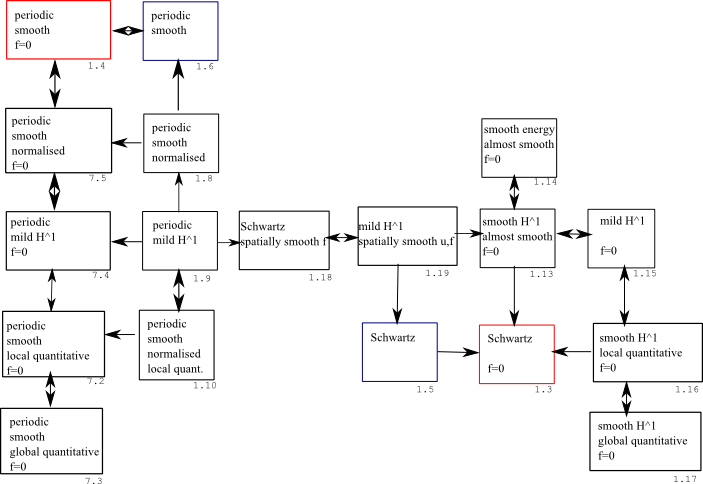 The full equations and numerical methods used to perform such models are somewhat sophisticated, but by making a large number of simplifying assumptions, it is relatively easy to come up with a rough model that already predicts the basic features of tsunami propagation, such as the velocity formula (1) and the amplitude proportionality law (2). I give this (standard) derivation below the fold. The argument will largely be heuristic in nature; there are very interesting analytic issues in actually justifying many of the steps below rigorously, but I will not discuss these matters here.